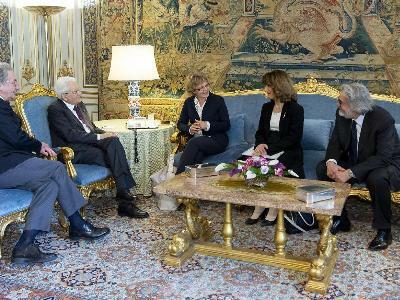 The President of the Republic, Sergio Mattarella, has received at the Quirinale professor Michele De Luca, Director of the Centre of Regenerative Medicine Stefano Ferrari of the University of Modena and Reggio Emilia, and the coordinator of the Cell Therapy of the Centre, Graziella Pellegrini, both winners of the 2018 edition of the Price for Innovation, awarded to them by the International Society for Stem Cell Research (ISSCCR) for the original ideas and pioneering research relating to stem cells and regenerative medicine. Attending the meeting was Senator for life, Professor Elena Cattaneo. I would like to thank President Mattarella for his hospitality and the attention he devoted to us. It was really exciting for us to have the opportunity to report to the Head of State the results achieved by the Italian research on a frontier field such as regenerative medicine, in which our Country represents an international excellence, also thanks to the effort of talented colleagues who work as we do in the field of cell and gene therapies. This is what the Director of the Centre for Regenerative Medicine Stefano Ferrari of the University of Modena and Reggio Emilia, professor Michele De Luca, declared, with Ansa (the national press agency) joining him, after todays meeting with President Mattarella together with his colleague, professor Graziella Pellegrini, coordinator of the cell therapy in the same centre. Professor Pellegrini added that An important positive message that I have understood from the President is the interest in the commitment to research that we share with Senator for life and scientist Elisa Cattaneo. During the meeting we found our positions in line on the need to enhance the basic free research to reach new goals to the benefit of our Country and on the importance of the new reconstruction techniques of organs and tissues to gain a high-precision medicine. Senator Cattaneo, who was attending the meeting, was interviewed by the press agency and observed that From the sensitivity of President Mattarella to the fostering of public research, starting from the world scientific excellences in the field of regenerative medicine expressed by the Country, I would like to remember the moment when the researchers handed the President a copy of their most important scientific publications, the result of decades of hard study and work. I believe that the gesture of the President may be extended to all our colleagues who every day dedicate their life to the progress of knowledge for the interest of all people.